I was born to Rolf and Liselotte (nee Wassull) Dutzmann in Braunschweig, Germany on January 11, 1947. My family immigrated to America on New Year’s Eve 1951 with 12-day-old Zurich, Switzerland-born sister, Marina, having burst onto the scene. We settled with sponsors in Wakarusa, Indiana where brother, Roland was born and subsequently lived in Saginaw and Utica, Michigan where my father was involved in the Space Program for the Chrysler Missile and Space Division. Mom lives nearby in Brentwood, New Hampshire, where Dad, who passed away in 2014, taught school children to build and launch model rockets into his 90’s. I graduated from Utica High School, Michigan in 1965 and received a BA (1969) and MA (1971) at Oakland University in Rochester, Michigan and Wayne State University in Detroit respectively. I was blessed to marry Daria Manchuk in Detroit in 1973. Various Student Affairs positions at Oakland University framed my professional life from 1969-76. From 1957-81 I was a member of Trinity Lutheran Church, Utica, served as its youngest elder from 1969-76, and was blessed with the remarkable ministries of Senior Pastors Leroy Biesenthal and Dale Thomas, who both encouraged me to consider becoming a pastor. After a less-than-stellar two years of study at Detroit College of Law, I entered Concordia Seminary, St. Louis in 1976. 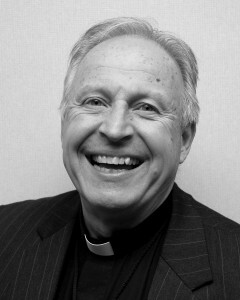 I summer interned in Burlington, Vermont for New England District President, Martin Dienst, in 1977, vicared at Christ Lutheran Church in Lincoln, Nebraska under the Reverend Doctor Charles Reimnitz from 1978-79, and received a Masters of Divinity degree in 1980 and a Sacred Theology Masters degree in 1987, both from Concordia. My wife, Daria, and I are blessed with four married children; Alexander, married to Amy of Taunton, Massachusetts; Allegra, married to Matthew Bain of Pembroke, Massachusetts; Mercedes, married to Andrew Hendricks of Irvine, California; and Dominique, married to Ryan DiAndrea of Addison, Texas. The four in-law children still like us—truly a gift from Heaven. Two grandchildren, Tristin Dutzmann and Adelina Bain, make our current family a beautiful even dozen. I was privileged to serve Calls at Grace Lutheran Church, Regina, Saskatchewan, Canada from 1981-83; Redeemer Lutheran Church, Cape Elizabeth, Maine from 1983-90; The Woodlands Lutheran Church and Camp, Mont Verde, Florida, 1990; Lutheran Church of the Way, Taunton and Raynham, Massachusetts from 1990-97; and The First Lutheran Church of Boston from 1997 to the present. My service to the New England District of the Lutheran Church Missouri Synod has included the positions of Vice-President for the Lutheran Church Extension Fund since 1991 and Speaker (1997) and Director (1998 to the present) of Lutheran Camp Winni at Geneva Point on Lake Winnipesaukee in Moultonborough, New Hampshire. In addition, I have served as New England Lutheran Women’s Missionary League District Advisor, Worship Commission member, Circuit Counselor, Board of Directors member, and Chairman of the District Finance Board as well as of the Constitution Re-Write Committee. I am truly blessed with the respect of my wife, Daria, who is also an accomplished musician, aerobics instructor, seamstress, and cook. She has won awards in ice-skating, dancing, and theater. Playing with grandchildren, reading, collecting books and stamps, skiing, table tennis, hiking, chess, and apologetics bring balance to my life. The privilege of drawing people closer to Jesus is beyond fulfilling. The First Lutheran Church of Boston was founded on February 18, 1839 on the 293rd anniversary of the death of Martin Luther by a vote of both houses of the Massachusetts Legislature. It is a unique urban congregation with many young, vibrant, dedicated, generous, and gifted congregants. We have embraced traditional liturgy and music; installed the best Bach organ in Boston; and have established and continue to support ministries for families, students, urban professionals, the blind, Brazilians and Eritreans, a braille press, and dynamic Vacation Bible and Sunday Schools. First Lutheran also cares for the poor and for ex-prisoners in addition to supporting Concordia College in Bronxville, New York; the Lutheran seminaries in St. Louis and Fort Wayne; Lutheran Social Services’ Ruth House in Brockton, Massachusetts; and the Lutheran Malaria Initiative.